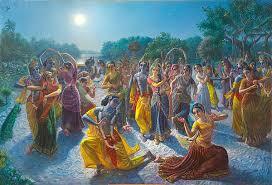 The first full moon of the autumn season marks the celebration of Krsna’s dancing with the gopis. On this day the deities of Vrndavana are nicely decorated in white. Krsna lila dramas are enacted. Because the moon is very auspicious, the Vrajavasis leave pots of sweet rice exposed to the full moon for the whole night, to turn the sweet rice into ambrosial amrta.